• Choose bananas that are slightly green on the stem and tip. They should be firm, without bruises. • Store unripe bananas at room temperature. Store ripe bananas in refrigerator for up to two weeks; skin may turn black. Nutrition Facts: Calories, 330; Calories from fat, 150; Total fat, 17g; Saturated fat, 2.5g; Trans fat 0g; Cholesterol, 5mg; Sodium, 90mg; Total Carbohydrate, 48g; Fiber, 8g; Protein, 10g; Vit. A, 110%; Vit. C, 25%; Calcium, 10%; Iron, 10%. 1. 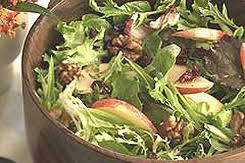 Toss lettuce, apples, walnuts, cranberries, and onions in large bowl. 2. Add dressing; toss to coat. Serve immediately. Nutrition Facts: Calories, 140; Calories from fat, 45; Total fat, 5g; Saturated fat, 0g; Trans fat 0g; Cholesterol, 0mg; Sodium, 10mg; Total Carbohydrate, 24g; Fiber, 3g; Protein, 2g; Vitamin A, 8%; Vitamin C, 8%; Calcium, 2%; Iron, 12%. Source: Adapted from: Creative Recipes for Less Familiar USDA Commodities, USDA Food and Nutrition Service. 1. 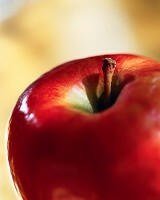 Wash apples, celery, and carrots before dicing and grating. 2. Toss apples with lemon juice. 3. Add celery, carrot, and raisins. 4. Fold yogurt into apple mixture. 5. Cover. Chill for at least 1 hour before serving. Be creative! 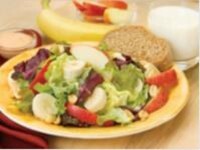 Try adding ½ cup of chopped walnuts, almonds, or pecans to the salad. Nutrition Facts: Calories, 90; Calories from fat, 5; Total fat, 0g; Saturated fat, 0g; Trans fat 0g; Cholesterol, 0mg; Sodium, 40mg; Total Carbohydrate, 19g; Fiber, 2g; Protein, 2g. 1. 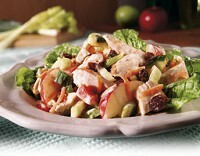 In a large bowl, combine turkey, celery, apples and raisins. 2. In a small bowl, combine mayonnaise, yogurt, nutmeg and cinnamon. 3. Fold into turkey mixture. 5. Serve on crisp lettuce leaves and garnish with grated Cheddar cheese, if desired. Nutrition Facts: Calories, 138; fat, 4 g; calories from fat, 34; sodium, 161 mg; carbohydrate, 14 g; fiber, 2 g.
1. Cook asparagus in a large pot of boiling water until tender, about 4 minutes. 2. Drain: rinse with cold water to cool quickly, and drain again. 3. Pat dry; wrap in a paper towel and then plastic wrap and refrigerate. 4. Melt margarine in a heavy large skillet over medium-high heat. 5. Add lemon peel and garlic and stir for 30 seconds. 6. Add asparagus and toss to coat. 7. Sprinkle with lemon juice. Sauté until asparagus is heated through and coated with Gremolata sauce, about 3 minutes. 8. Transfer to platter. Sprinkle with parsley and serve. Nutrition Facts: Calories, 70; Calories from fat, 35; Total fat, 4g; Saturated fat, 0.5g; Trans fat 0g; Cholesterol, 10mg; Sodium, 35mg; Total Carbohydrate, 6g; Fiber, 3g; Protein,13 g; Vit. A, 25%; Vit. C, 20%; Calcium, 4%; Iron, 20%. Source:Cornell University Cooperative Extension, Eat Smart New York! 1. In a large saucepan, place asparagus in 1 inch boiling water. 2. Cover and steam for 5 minutes or until asparagus is bright green and tender. 3. Rinse asparagus under cold water and drain. 4. In a small bowl, combine oil and lemon juice. Pour over asparagus. Nutrition Information per Serving: Calories 70, Total Fat 3 g (4% DV), Saturated Fat 0 g (0% DV), Cholesterol 0 mg (0% DV), Sodium 0 mg (0% DV), Total Carbohydrate 9 g (3% DV), Dietary Fiber 5 g (20% DV), Sugars 4 g, Protein 5 g, Vitamin A 35%, Vitamin C 25%, Calcium 6%, Iron 25%. Nutrition Facts: Calories, 300; Calories from fat, 70; Total fat, 8g; Saturated fat, 1.5g; Trans fat 0g; Cholesterol, 0mg; Sodium, 320mg; Total Carbohydrate, 59g; Fiber, 6g; Protein, 2g; Vitamin A, 310%; Vitamin C, 10%;, Calcium, 6%; Iron, 6%. Source: Adapted from: Pennsylvania Nutrition Education Network Website Recipes, USDA, Snap-ed Connection. 1. In a mixing bowl, stir together onion, red or green pepper, chili pepper (if using), corn and beans. 2. In a jar with a tight fitting lid, add vinegar, chili powder, garlic, salt, pepper and vegetable oil. Shake until dressing is evenly mixed. 3. Pour dressing over bean mixture and stir to mix evenly. Chill for at least one hour. 4. Serve cold as a side dish or main dish. Note: When handling hot peppers, the oils can cause burning and skin irritation. You can wear clean kitchen gloves or wash hands thoroughly after preparing. KEEP HANDS AWAY FROM EYES. 2. Bake potatoes for 30-60 minutes or until done. 3. Peel broccoli stems. Steam whole stalks until tender and chop finely. Put in a bowl and set aside. 4. Slice the potatoes in half and scoop out the insides into the bowl with the broccoli. Set the potato skins aside. 5. Add milk, 3/4 cup cheese and black pepper to potato and broccoli mixture. Mash ingredients together. 6. 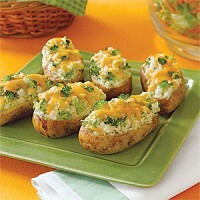 Heap the mixture into the potato jackets and sprinkle with the remaining cheese. 7. Bake for 15 minutes or until heated through. Nutrition Facts: Calories, 210; Calories from fat, 19 ; Total fat, 2g; Saturated fat, 1g; Trans fat 0g; Cholesterol, 5mg; Sodium, 140mg; Total Carbohydrate, 39g; Fiber, 5g; Protein, 10g; Vitamin A, 4%; Vitamin C, 90%; Calcium, 10%; Iron, 10%. 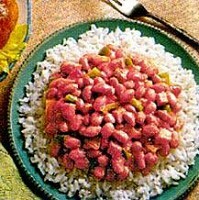 Make beans without lard or other fat. 1. Rinse and pick through the beans. Put the beans into a large pot and add 10 cups of water. Place the pot into the refrigerator and allow the beans to soak overnight. 3. Add the plantains, tomato, pepper, onion, garlic, and salt. Continue cooking at low heat until the plantains are soft. 1. In a large bowl, mix all ingredients together, except lettuce. 2. Cover with plastic wrap and refrigerate for 15 minutes. 3. Toss again before serving. 2. Place 1½ cups of the romaine in each of 4 large bowls or plates. 3. Combine chopped vegetables, chicken and pasta. 4. Add dressing; toss lightly to coat. Divide evenly among the 4 bowls. 5. 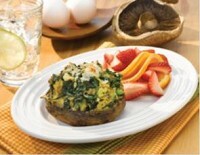 Top each serving with a few egg slices, if desired, and 1 Tablespoon of the shredded cheese. Nutrition Facts: Calories, 270; Calories from fat, 60; Total fat, 6g; Saturated fat, 1.5g; Trans fat 0g; Cholesterol, 60mg; Sodium, 380mg; Total Carbohydrate, 29g; Fiber, 6g; Protein, 24g; Vit. A, 200%; Vit. C, 50%; Calcium, 15%; Iron, 15%. 1. Wash potatoes, leave skin on and cut in bite-size chunks. 2. Place in pan and cover with water. Bring to a boil, lower to simmer and cook uncovered until potatoes are tender, about 20 minutes. 3. Drain in colander and sprinkle lightly with cold water. 4. In the meantime, put the rest of the ingredients in a large mixing bowl. Add drained potatoes to the bowl. 5. Mix well and refrigerate until ready to use. Nutrition Facts: Calories, 180, Calories from Fat, 90; Total Fat, 10g, Saturated Fat, 1.5g; Trans Fat, 0g; Cholesterol, 10mg; Sodium, 330mg; Total Carbohydrate, 18g; Dietary Fiber, 5g; Sugars, 8g; Protein, 6g. 1. Drain and rinse the black-eyed peas (or black beans) and corn. 2. Finely chop the cilantro and green onions. 3. Dice the avocados and tomatoes. 4. Combine all ingredients in a large bowl. 5. Mix oil, vinegar (or lime juice), and salt and pepper together in a small bowl. 6. Pour oil mixture over salad ingredients and toss lightly. 7. Serve with your favorite meal or as a snack with tortilla chips! Tip: Try adding other vegetables, such as sweet or hot peppers or zucchini. Nutrition Facts per Serving: Calories, 70; Calories from fat, 20; Total fat 2.5g; Saturated fat, 0g; Trans fat 0g; Cholesterol, mg; Sodium, 150mg; Total Carbohydrate, 9g; Fiber, 2g; Protein, 2g; Vitamin A, 8%; Vitamin C, 15%; Calcium, 2%; Iron, 4%. 1. In a small bowl combine all the ingredients. 2. Serve as an appetizer on crackers or as a vegetable dip. Nutrition Facts: Calories: 60, Total fat: 5 g, Sodium, 240 mg. Total carbohydrate, 3 g, Fiber 0 g.
2. Cut leaves off of thick stem and thoroughly dry leaves in a salad spinner or by blotting with paper towels. Discard stems. 3. Tear or cut leaves into bite sized pieces. Place in large bowl. 4. Drizzle oil over kale and toss to coat well. 5. Place kale leaves onto cookie sheet. 7. Bake at 350 degrees until edges brown. About 10-15 minutes. Nutrition Facts: Calories, 60; Calories from fat, 25; Total fat, 3g; Saturated fat, 0g; Trans fat 0g; Cholesterol, 0mg; Sodium, 290mg; Total Carbohydrate, 9g; Fiber, 2g; Protein, 3 g; Vit. A, 270%; Vit. C, 180%; Calcium, 10%; Iron, 3%. 2. Melt butter or margarine in an 8 inch baking pan. 3. Beat eggs well. Add flour, milk, garlic and baking powder. Pour into baking pan. 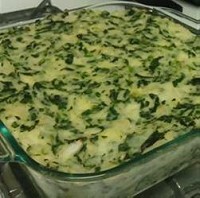 Stir in cheese and spinach. 4. Bake for 30-35 minutes or until firm and the cheese is slightly golden brown. Nutrition Facts: Calories, 310; Calories from fat, 140; Total fat, 16g; Saturated fat, 7g; Trans fat 0g; Cholesterol, 145mg; Sodium, 410mg; Total Carbohydrate, 29g; Fiber, 1g; Protein,13 g; Vit. A, 60%; Vit. C, 10%; Calcium, 35%; Iron, 15%. 2. 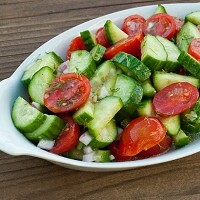 Toss together the cucumbers, tomatoes, onions, couscous (or rice), dill, and salad dressing. Nutrition Facts: Calories, 150; Calories from fat, 30; Total fat, 3.5g; Saturated fat, 0.5g; Trans fat 0g; Cholesterol, 0mg; Sodium, 280mg; Total Carbohydrate, 25g; Fiber, 2g; Protein, 4g; Vit. A, 8%; Vit. C, 15%; Calcium, 2%; Iron, 4%. 1. 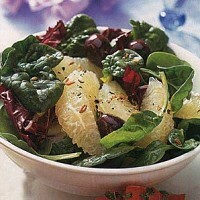 Tear spinach coarsely and place in large salad bowl. 2. Add mushrooms, water chestnuts, and grapefruit. 3. Mix together oil, vinegar, grapefruit juice, soy sauce, hot pepper sauce, salt, and dry mustard. 4. Toss dressing with spinach mixture and serve. Nutrition Facts: Calories, 140; Calories from fat, 80; Total fat, 10g; Saturated fat, 1g; Trans fat 0g; Cholesterol, 0mg; Sodium, 310mg; Total Carbohydrate, 12g; Fiber, 3g; Protein, 3g; Vit. A, 100%; Vit. C, 70%; Calcium, 6%; Iron, 8%. 1. Place oven rack in center of oven; preheat oven to 375 °F. 2. Remove portabella stems; wipe clean with damp paper towel. 4. In a mixing bowl, whisk together all remaining ingredients, except 1 tablespoon Parmesan cheese. 7. Using a large spoon, scoop partially cooked, hot egg mixture into portabella caps. Serve with ¾ cup strawberries and orange slices (or other fresh, frozen, or canned fruit), water with lime or lemon slice/wedge. Nutrition Facts: Calories, 190; Calories from fat, 60; Total fat, 6g; Saturated fat, 2g; Trans fat 0g; Cholesterol, 145mg; Sodium, 330mg; Total Carbohydrate, 14g; Fiber, 4g; Protein, 17g; Vit. A, 120%; Vit. C, 2%; Calcium, 20%; Iron, 15%. 1. Drain and coarsely chop tomatoes. Save liquid. 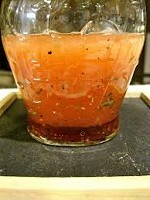 Mix together tomatoes and reserved liquid, onion, green beans, okra, green pepper, lemon juice, and herbs. Cover and bake at 325º F for 15 minutes. 2. 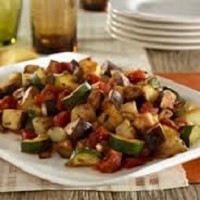 Mix in zucchini and eggplant, and continue baking, covered, 60-70 more minutes or until vegetables are tender. Stir occasionally. 3. Sprinkle top with Parmesan cheese just before serving. 3. Wash and remove the stem end, and slice the eggplants into 1/2-inch slices. 4. Spray a baking pan with vegetable oil spray and lay the eggplant in the pan in a single layer. 5. Spoon low-sodium pizza or spaghetti sauce on each slice. 8. Drizzle the sauce in thin lines on each of the eggplant slices before serving. You can do this easily by putting the sauce in a plastic squirt bottle or using a spoon. Nutrition Facts: Calories, 120; Calories from fat, 15; Total fat, 2g; Saturated fat, 0g; Trans fat 0g; Cholesterol, 0mg; Sodium, 30mg; Total Carbohydrate, 26g; Fiber, 7g; Protein, 4g; Vit. A, 10%; Vit. C, 8%; Calcium, 6%; Iron, 6%. 1. Combine all ingredients except vegetables into bowl, mix and set aside. 2. Heat 2 teaspoons of oil in skillet and add frozen vegetables. Cook for 3-4 minutes or until vegetables are crisp-tender. 3. Add sweet and sour sauce and cook for another 2 minutes or until mixture comes to a boil. 4. Serve immediately. This dish is great over pasta or brown rice. Nutrition Facts per serving: Calories, 80; Calories from fat, 15 ; Total fat, 1.5g; Saturated fat, 0g; Trans fat 0g; Cholesterol, 0mg; Sodium, 45mg; Total Carbohydrate, 14g; Fiber, 1g; Protein, 1g; Vitamin A, 10%; Vitamin C, 45%; Calcium, 2%; Iron, 2%. 1. Combine olive oil and garlic in a large saucepan. Cook until garlic is soft, but not browned (about 30 seconds). 2. Add onion, and continue to cook for about 5 minutes over medium heat until soft. 3. Add green beans and chicken broth. Bring to a boil and simmer for 2 minutes, until the beans are heated through. 4. Sprinkle with parmesan cheese and pepper, and serve. 2. Cut the peppers in half from top to bottom. Remove the stem and seeds. 3. In a large skillet over medium heat, cook the turkey until no longer pink. Add seasonings during last few minutes. 4. Add onion, mushrooms, and zucchini to the skillet. Add a small amount of oil, if needed. Sauté until tender. 5. Mix in the tomatoes and rice. Remove from heat. 6. Fill the pepper halves with the skillet mixture. 7. Cover the baking dish with foil. Bake at 350 degrees for 40 to 50 minutes or until peppers are tender when poked with a fork. Nutrition Facts: Calories, 140; Calories from fat, 40; Total fat, 4g; Saturated fat, 1g; Trans fat 0g; Cholesterol, 35mg; Sodium, 350mg; Total Carbohydrate, 16g; Fiber, 2g; Protein,13 g; Vit. A, 8%; Vit. C, 110%; Calcium, 6%; Iron, 8%. 2. Wash your hands and work area. 3. In large bowl, combine hash browns, green pepper, 1/4 cup onion, salt, and 1/4 teaspoon pepper. 4. Spray an 8x8 inch baking dish with non-stick cooking spray. Press potato mixture into bottom. 5. Bake until lightly browned around edges, 20-25 minutes. 6. 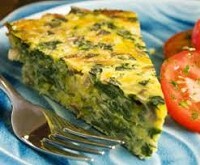 In large bowl, stir together evaporated milk, egg whites, 1/4 teaspoon pepper, cheeses, spinach, remaining 1/4 cup onion, and tomatoes. 7. Reduce oven temperature to 350 degrees. 8. Pour mixture over potato crust. Bake uncovered until center is set, 40-45 minutes. 9. Cover and let stand for 10 minutes. Cut into 6 pieces. Serve hot. Nutrition Facts: Calories, 180; Calories from fat, 35; Total fat, 4g; Saturated fat, 2.5g; Trans fat 0g; Cholesterol, 15mg; Sodium, 490mg; Total Carbohydrate, 21g; Fiber, 1g; Protein,15 g; Vit. A, 25%; Vit. C, 25%; Calcium, 45%; Iron, 2%. 2. Combine all the ingredients for the sauce and mix. 3. 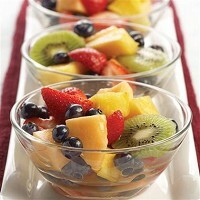 Just before serving, pour honey orange sauce over the fruit. Nutrition Facts: Calories: 96; Total fat: 1 g; Saturated fat: less than 1 g; Cholesterol: 0 mg; Sodium: 4 mg; Fiber: 3 g; Protein: 1 g; Carbohydrate: 24 g; Potassium: 302 mg.
2. Place very large metal roasting pan or cookie sheet in oven and heat for 15 minutes (or 2 large metal roasting pans – vegetables should be in a single layer). 3. Wash vegetables, especially those you intend to use with peels on. Cut into pieces. 4. Place vegetables in a very large bowl, mix with oil, lemon juice and herbs. 5. Remove pan(s) from oven. 6. Spray pan(s) generously with vegetable oil cooking spray. 7. Add vegetables in a single layer to pans. 8. Roast in oven until tender, stirring occasionally, about 45 minutes. 9. Let roasted vegetables sit out of the oven for 10 minutes before serving. 10. Season with black pepper and salt to taste. Nutrition Facts: Calories: 120; Fat: 6 g; Fiber: 3 g.
1. In a large skillet, melt margarine over medium heat. 2. Add onion and cook, stirring until softened. 3. Add zucchini and cook for 2 minutes. 4. 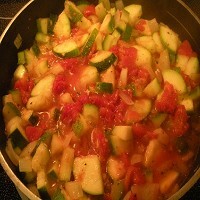 Add tomatoes and cook for 3 to 5 minutes or until zucchini is crisp-tender. 5. Season to taste with pepper. Nutrition Facts: Calories, 50; Calories from fat, 9; Total fat, 1.5g; Saturated fat, 1g; Trans fat 0g; Cholesterol, 0mg; Sodium, 20mg; Total Carbohydrate, 11g; Fiber, 3g; Protein, 2g; Vit. A, 15%; Vit. C, 60%; Calcium, 4%; Iron, 4%. 1. Wash and shred the cabbage with a knife or grater. Put in a mixing bowl. 2. Bring the vinegar and water to a boil in the saucepan. Remove from heat and add other ingredients except cabbage to the saucepan. 3. Continue to cook this mixture in the saucepan until the sugar is dissolved and hot, and then pour over the shredded cabbage. 4. Toss. Refrigerate until chilled to blend flavors. Nutrition Facts: Calories, 40; Calories from Fat, 0; Total Fat, 0g; Saturated Fat, 0g; Trans Fat, 0g; Cholesterol, 0mg; Sodium, 5mg; Total Carbohydrate, 9g; Dietary Fiber, 1g; Sugars, 7g; Protein, 1g. Source: Adapted by Alice Henneman, University Nebraska-Lincoln Extension, from: Eating Right is Basic, Nutrition Education Program, Michigan State University Cooperative Extension Service. 1. Wash squash and cut in half lengthwise. Remove and discard seeds. 2. Place squash, cut sides down, in a Dutch oven. Add water to pan to depth of 2 inches. 3. Bring to a boil, reduce heat, and simmer 20-25 minutes, or until squash is tender. Drain squash and let cool. 4. Using fork, remove spaghetti-like strands from squash. Discard shells. 5. Place strands in a serving bowl and add parsley, margarine, and other seasonings. 6. Gently toss and serve. Nutrition Facts: Calories: 50; Total Fat: 1.5g; Saturated Fat: 0g; % of Calories from Fat: 27%; Cholesterol: 0mg; Carbohydrates: 9g; Dietary Fiber: 2g; Sodium: 105mg; Protein: 1g%. Source: University of Illinois Extension Family Nutrition Program. 1. Wash and cut squash in half, lengthwise. Remove the large seeds. 2. Steam the squash, skin side down, in a small amount of water in a fry pan or skillet until slightly tender (but not mushy). 3. Scoop out a good amount of pulp (1 cup), place in a bowl and mix with stuffing (brown rice through Parmesan cheese). 4. 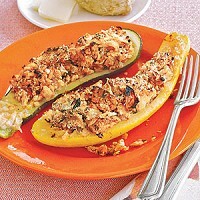 Place the squash shells in a baking dish. Stuff the squash with the stuffing mixture. 5. Top with grated Parmesan cheese. Bake at 350°F for about 30 minutes. Rice + Turkey Stuffing: 1 cup squash pulp, 1 pound cooked ground turkey, 2 cups cooked brown rice, 1 can low-sodium condensed cream of mushroom soup, 2 Tablespoons shredded cheddar cheese. Nutrition Facts: Calories, 290; Calories from fat, 25; Total fat, 3g; Saturated fat, 1g; Trans fat 0g; Cholesterol, 5mg; Sodium, 160mg; Total Carbohydrate, 54g; Fiber, 7g; Protein,12g; Vit. A, 6%; Vit. C, 35%; Calcium, 15%; Iron, 20%. 2. Peel the onion. Chop it into small pieces. 3. Cut each tomato in half. Remove the part with the stem. 4. Gently squeeze each tomato half over the sink to remove the seeds. 5. Put the breadcrumbs into medium bowl. Add the spices and oil. 6. Mix well, slowly adding water to moisten the crumbs. 7. 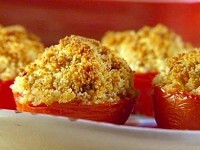 Use a spoon to press the crumb mixture into the tomato halves. 8. Lightly oil a baking pan. Place the tomatoes on the pan, with the cut side up. 9. Bake for 15-20 minutes, until the crumbs are browned and the tomatoes are soft. Nutrition Facts: Calories, 110; Calories from fat, 30; Total fat, 3.5g; Saturated fat, 0g; Trans fat 0g; Cholesterol, 0mg; Sodium, 140mg; Total Carbohydrate, 17g; Fiber, 2g; Protein, 3 g; Vit. A, 10%; Vit. C, 20%; Calcium, 6%; Iron, 10%. 2. 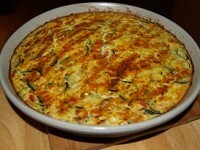 Combine onion, squash, tomato, and green pepper in a baking dish. 4. Pour the tomato sauce over the vegetables. 5. Bake uncovered at 350°F for 20-30 minutes. 6. Top with cheese and bake another 4-5 minutes until cheese is melted. Be Creative! Try adding 1 pound of seasoned, fully cooked ground turkey. Nutrition Facts per Serving: (without ground turkey) Calories, 60; Calories from fat, 20; Total fat, 2g; Saturated fat, 1g; Trans fat 0g; Cholesterol, 5mg; Sodium, 250mg; Total Carbohydrate, 7g; Fiber, 1g; Protein, 4g. 1. Cook pasta according to package directions. Rinse with cold water. Place in large bowl. 3. Refrigerate leftovers within 2 hours. Use any colorful vegetables you have on hand: carrots, cherry tomatoes, green onions, or frozen peas. Nutrition Facts: Calories, 220; Calories from fat, 25; Total fat, 3g; Saturated fat, 0g; Trans fat 0g; Cholesterol, 0mg; Sodium, 240mg; Total Carbohydrate, 43g; Fiber, 5g; Protein, 8 g; Vit. A, 2%; Vit. C, 30%; Calcium, 4%; Iron, 10%. 1. Prepare pasta according to package directions; drain. Rinse under cold water and drain again. 2. In a large bowl, stir together the pasta, kidney beans, chickpeas, green beans, onion and bell pepper. In a small bowl, stir together the remaining ingredients. 3. Toss pasta with dressing and serve. For added fiber, use whole grain pasta. If time allows — before serving, chill this pasta dish in the refrigerator for an hour or more to allow flavors to blend.Eat within two days of preparation for best quality and safety. 1. In a medium sized bowl, combine yogurt, pepper, garlic powder, dried onion, dried parsley, salt, and dill (if used). Beat until smooth. 2. 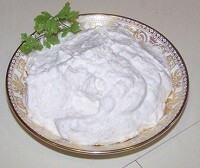 Chill dip in refrigerator until ready to serve. Serve with raw vegetables. Nutrition Facts (creamy dip): Calories, 30; Calories from fat, 5; Total fat, .5g; Saturated fat, 0g; Trans fat 0g; Cholesterol, 5 mg; Sodium, 125mg; Total Carbohydrate, 4g; Fiber, 0g; Protein, 2g. 1. Place the garlic cloves into a small saucepan and pour enough water (about ½ cup) to cover them. 2. Bring water to a boil, then reduce heat and simmer until garlic is tender, about 15 minutes. 3. Reduce the liquid to 2 tablespoons and increase the heat for 3 minutes. 4. Pour the contents into a small sieve over a bowl, and with a wooden spoon, mash the garlic through the sieve into the bowl. 5. Whisk the vinegar into the garlic mixture; incorporate the oil and seasoning. Nutrition Facts: Calories: 32; Total fat: 3 g; Saturated fat: less than 1 g; Cholesterol: 0 mg; Sodium: 0 mg; Fiber: 0 g; Protein: 0 g; Carbohydrate: 1 g; Potassium: 6 mg.
1. Wash and cut the apples into quarters, core, then dice into 3/4-inch pieces. Toss with the lemon juice. 2. Add the celery, walnuts, and mayonnaise dressing. Mix thoroughly. 3. Place the lettuce on four plates or into salad bowls. 4. Scoop the apple mixture onto each salad. 5. Scatter raisins over the top. Nutrition Facts: Calories: 129, Total fat: 4 g, Saturated fat: 0 g, Carbohydrate: 25 g, Sodium: 163 mg, Fiber: 4 g.
1. 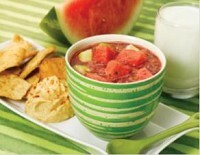 In a small bowl, mix 1 cup of cubed watermelon and ½ of chopped cucumber; set aside. 2. Process remaining ingredients in a food processor or blender until puréed. 3. Transfer all ingredients to a large bowl and stir. Nutrition Facts: Calories, 70; Calories from fat, 15; Total fat, 1.5g; Saturated fat, 0g; Trans fat 0g; Cholesterol, 0mg; Sodium, 0mg; Total Carbohydrate, 13g; Fiber, 1g; Protein, 1g; Vit. A, 20%; Vit. C, 25%; Calcium, 2%; Iron, 2%. 1. In a medium bowl, mix all of the ingredients. 2. Try adding corn or frozen corn, chili peppers or chopped avocado. 3. If you do not have vinegar, try lemon or lime juice. 4. Serve sauce with burritos or grilled meat. Nutrition Facts: Calories, 30; Calories from fat, 0; Total fat, 0g; Saturated fat, 0g; Trans fat 0g; Cholesterol, 0mg; Sodium, 80mg; Total Carbohydrate, 9g; Fiber, 1g; Protein, 0g; Vit. A, 6%; Vit. C, 10%; Calcium, 2%; Iron, 2%. Nutrition Facts per Serving: Calories, 150; Calories from fat,10; Total fat, 1g; Saturated fat, 0g; Trans fat, 0g; Cholesterol, 0mg; Sodium, 260mg; Total Carbohydrate, 31g; Fiber, 4 g; Protein, 6g. 1. Prick potatoes with fork. Bake at 425º F for 60 minutes or until fork is easily inserted. 2. Cut potatoes in half lengthwise. Carefully scoop out potato, leaving about ½ inch of pulp inside shell. Mash pulp in large bowl. 3. Mix in by hand remaining ingredients except Parmesan cheese. Spoon mixture into potato shells. 4. Sprinkle top with ¼ teaspoon of Parmesan cheese. 5. Place on baking sheet and return to oven. Bake 15-20 minutes or until tops are golden brown. 1. Mix all ingredients in bowl and refrigerate. Nutrition Facts: Calories: 39; Total fat: 2 g; Saturated fat: less than 0 g; Cholesterol: 3 mg; Sodium: 66 mg; Fiber: 0 g; Protein: 2 g; Carbohydrate: 4 g; Potassium: 110 mg; Calcium: 76 mg, Magnesium: 10 mg.
1. Put all the ingredients in a jar or bottle with a lid. 2. Put on the lid. Shake well. 3. Chill in the fridge for at least 1 hour before serving. Nutrition Facts per serving: Calories, 35; Calories from fat, 25 ; Total fat, 3g; Saturated fat, 0g; Trans fat 0g; Cholesterol, 0mg; Sodium, 115mg; Total Carbohydrate, 2g; Fiber, 0g; Protein, 0g; Vitamin A, 0%; Vitamin C, 0%; Calcium, 0%; Iron, 2%. 1. First wash and slice the zucchini and measure out about 2 cups. Dice up the onion and green pepper and set aside along with the zucchini. 2. Stir the egg and milk together and set aside. 3. Sauté the veggies until tender on medium heat with the oil. Remove from the pan. 4. Next, scramble the egg mixture until cooked thoroughly. 5. Stir in the veggie mixture and fold together. Simmer until temperature reaches 145°F. 6. Sprinkle the seasoning and then cheeses on top. Continue to heat until melted. Serve warm. Nutrition Facts: Calories, 150; Calories from fat, 100; Total fat, 11g; Saturated fat, 2g; Trans fat 0g; Cholesterol, 55mg; Sodium, 200mg; Total Carbohydrate, 6g; Fiber, 1g; Protein, 7g; Vit. A, 6%; Vit. C, 30%; Calcium, 15%; Iron, 4%. 1. Wash zucchini and cut into 1/4-inch slices. 2. In large frying pan, cook onion in oil on medium heat until tender. 3. Add zucchini to onions and cook for 5 minutes. 4. Add tomato and seasoning; cook 5 more minutes. 5. Put mixture into an 8” x 8” square baking dish and sprinkle with cheese. 6. Bake at 375 degrees for 20 minutes. Nutrition Facts: Calories, 35; Calories from fat, 10; Total fat, 1.5g; Saturated fat, 0.5g; Trans fat 0g; Cholesterol, 5mg; Sodium, 140mg; Total Carbohydrate, 4g; Fiber, 1g; Protein, 2 g; Vit. A, 10%; Vit. C, 15%; Calcium, 2%; Iron, 2%.